Hand + Heart is a design created for the Where Do You Give? National Design Competition which was offered by the American Jewish World Service organization. The contest asked artists and designers to translate the Jewish tradition of giving to others, tzedakah, into a compelling and contemporary design. The design contest explored ways in current times in which people can give to others and how the values behind our giving can inspire us to expand where and how we give. 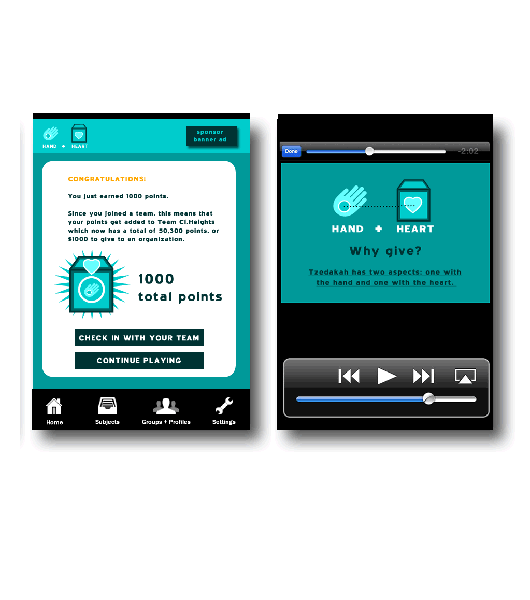 Hand + Heart is an online and mobile game where users can play the game, interact with others, and make a difference. The game promotes awareness about giving, provides a direct connection to contributing to others, and fosters awareness about giving to others in need. By playing the game, players will be able to earn points which add up into actual money and giving assistance to others. To play Hand + Heart, players can choose from various subjects including Jewish history and culture, developing nations history and culture, flags of the world, geography, and other subjects. 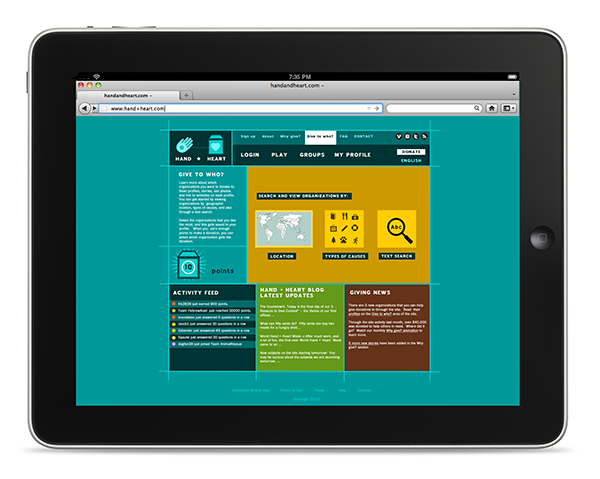 After choosing a subject, a player will see a multiple choice question on screen and will click on one of the four answers which he/she thinks is correct. If the correct answer is selected, the player will earn a coin (valued as 1 point). By playing the game, these points add up to actual money that will be donated to the organization of the player or teams’ choice. When logged in, a player can track their points, join and create teams, and find and follow friends. The funding comes from sponsors who advertise on the site, and also from players and groups who donate money through the site. Participating non-profit organizations that players can donate to include international and national non-profits and smaller organizations such as a school’s tzedakah collection box or a local food bank. 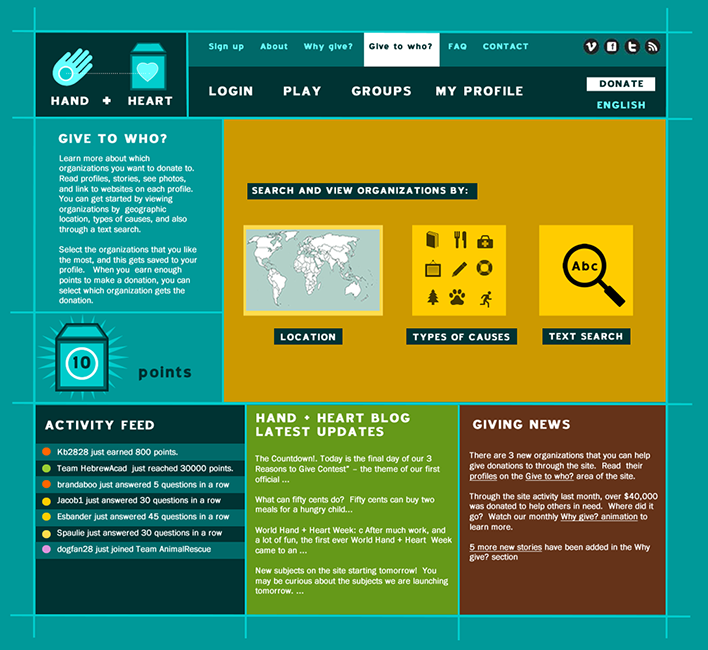 Hand + Heart provides many ways to engage users in giving. 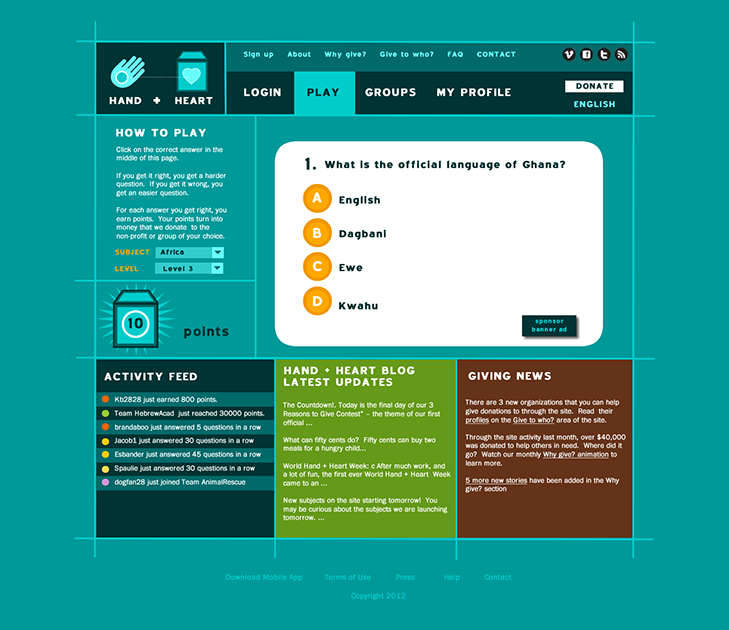 Once a user has signed up to play the game, a player begins to customize a profile. He/she is asked to read about and compare different organizations, and to prioritize and select who they would like to contribute their points to. Players will be asked to share a short story or quote about their experiences of giving which will be posted in the “Why give?” area of the site. An activity feed and blog will provide updates about gameplay, team activities, and recently posted player stories about giving. Through the gameplay and website, an online community of learning and giving will be created that connects to the real world. Players can create a group with friends, invite others to join a group, and teachers can create a group for a class. The login and profile of the game will link up with social networking sites such as Facebook and Twitter. After logging in and periodically while playing the game, short information graphic animations and videos will play that will present the values behind giving and stories about the organizations that are receiving support from the game. Periodically there will be contests, special events and incentives for players to participate in sharing stories, earning points, reaching point levels, and interacting with the site. Some special events will coincide with significant days and holidays that traditionally have been times of special acts of tzedakah including Passover and Purim. 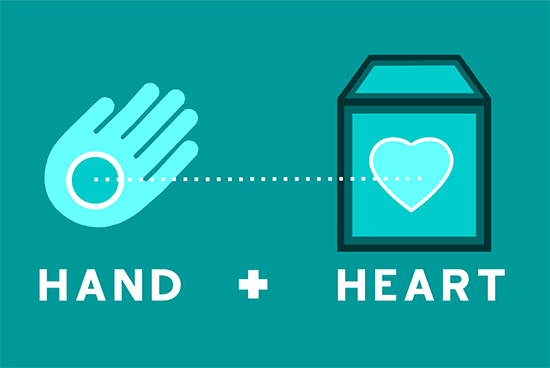 Hand + Heart reimagines the future of giving by establishing a dynamic online community based in learning and giving. Through using the website and mobile game, players will experience making decisions about who to give to, learn more about the value of giving, and experience being part of a community based in giving. On the website and mobile application, there will be a “Donate” button that organizations and players can access to make donations to support the website. By doing so, an organization, player, or group can become a sponsor of the site. Judaism teaches that donors benefit from tzedakah as much or more than the poor recipients. Whereas the poor receive money or other material assistance, the donor receives the merit of sharing and giving to others. Hand + Heart provides a unique interactive experience of being part of a giving community, contributing to giving to others in need, and in the two aspects of tzedakah which is giving with the hand and the heart.